Pacific horror: A new Catholic report has shown allegations of recent military and police intimidation, beatings and torture, kidnapping and murder in the country. The report documents religious, social and economic discrimination including how the carve up of land for major development has benefited multinationals and excluded Papuans from ownership and jobs. It refers to a slow motion genocide happening 250km north of Australia and states that “the Indonesians want to replace the Christian religion with Islam”. The report author Josephite Sister Susan Connelly was accompanied to West Papua by Brisbane archdiocese’s Catholic Justice and Peace Commission executive officer Peter Arndt. During their fact-finding mission they interviewed more than 250 community leaders in Japapura, Merauke, Timika and Sorong. Sr Connelly, a respected human rights advocate, likened her visit to West Papua to “stepping back twenty years when I first went to East Timor”. “The same fear. The same seemingly groundless hope. “A man took my hands in his and said, ‘We are in danger’. That simple statement sums up for me the experience of the whole visit. “The Papuan people have lost so much, and are facing erasure as a people, merely preserved as oddities of the past or artifacts to be photographed for tourist brochures. “There is clear evidence of ongoing violence, intimidation and harassment by the Indonesian security forces,” Mr Arndt said on his return to Brisbane. 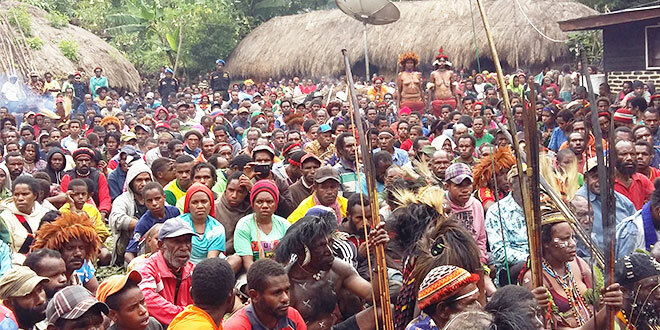 “That is especially the case for Papuans expressing their support for particular political points of view. Based on his interviews across West Papua, Mr Arndt (pictured) identified the instigators of alleged human rights violations as members of the Indonesian army including Kopassus, police including a special counter insurgency unit, Detachment 88, and Indonesia’s intelligence agency, BIN. “The procedure is that the local government invites companies to come and gives permits. “People are usually shocked when the companies come to sign a MoU (memorandum of understanding) with them, showing them the permit and the map. 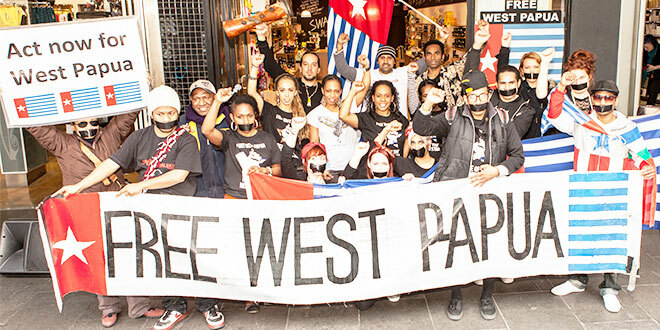 Troubling times: A group holds a Free West Papua protest in Melbourne. In the 1970s, ethnic Papuans accounted for 96 per cent of the population. Today they are a minority 48 per cent, because of the rapid migration of Indonesians from other more populated islands such as Java. The report found that Papuans were now marginalised economically at the expense of immigrants, the majority of whom are Muslims. The report said there was “a movement for Muslims from Indonesia to replace Papuans in every sector”. “The Indonesians want to replace the Christian religion with Islam. Many mosques are being built everywhere. They want Papua to be a Javanese Malay nation,” the report said. “Radicalisation is happening in Papua, with some militias very active near the border with PNG. “They burn down the Papuan houses. They are recruited as illegal loggers. Their camps and logging are well protected by the military. “The military are certainly killing the people, and closed access to opportunity to Papuans in all areas of life constitutes a slow motion genocide. “The general opinion encountered was that Indonesia is a total failure regarding Papua and is just another coloniser. “The Indonesian Government does not give opportunities to Papuan people or protect them. In January this year, 27 Papuan palm oil workers were allegedly tortured by the Indonesian army’s special force Kopassus. The men had previously complained to their company bosses after they had not been paid for two months. People reported they couldn’t move freely at night to search for food for fear of being kidnapped. The military and police use Papuan informers to let them know of people’s movements.